NIU graduate anthropology student Laurence Anthonie Tumpag was among 24 young Chicagoland Asian-American leaders honored Monday in Chicago. 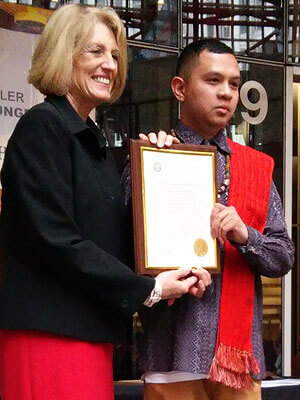 Illinois Comptroller Leslie Geissler Munger led the celebration at the James R. Thompson Center which was held to coincide with Asian Pacific American Heritage Month. The program also featured performances by traditional Korean folk music drumming group SoriBeat, the Chinese Mutual Aid Association Fan Dancers and Kollaboration Chicago 2014 Winner Paul Kay along with remarks from Munger and ABC7 Chicago anchor Judy Hsu. “Laurence’s articulate, passionate and breakthrough comparative analysis of Philippines artifacts, alongside those of nearby Asian countries and communities, has begun to shed light on how today’s Philippines evolved,” said Edgar Jimenez, president of the Filipino American Network of Chicago and Tumpag’s nominator. With a background grounded in celebrating the commonalities between people, Tumpag hopes to one day engage in social service work and peace-building efforts on behalf of the United States government, particularly within the museum profession by serving as an educator or curator. He has curated several cultural and educational exhibits throughout his academic career, including four at NIU. His exhibits aim to explore and celebrate the common origins found throughout the Austronesian diaspora, a region of the globe encompassing maritime Southeast Asian countries such as the Philippines as well as Madagascar and Oceania. 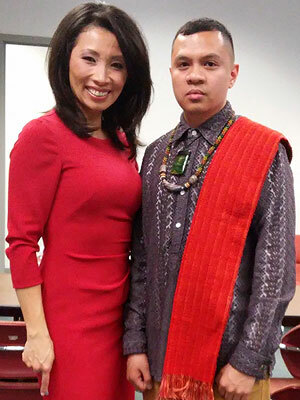 In 2013, Tumpag spoke at the Chicago Field Museum’s “10,000 Kwentos” kick-off ceremony. The co-curatorial project aims to facilitate a better understanding of Filipino heritage among the Filipino-American community through interaction with nearly 10,000 largely precolonial artifacts from the Philippines, a collection that has been laying in storage for more than a century since collected by American anthropologists in the early 1900s. During his talk, Tumpag encouraged members of the Filipino community to explore a comparative approach in their efforts to identity and better understand these artifacts. The Philippines and Indonesia share many commonalities in culture, he said, particularly during precolonial times. In addition to the individual honors, Munger presented the second annual John Vietnam Nguyen Asian American Youth Leadership Award to the Elephant Rebellion, a local music group that empowers community action through arts and education. Nguyen, a rising community leader from the Uptown neighborhood, was in his sophomore year at the University of Wisconsin in 2012 when he drowned after saving the life of another student. Last year, he became the first Vietnamese-American honored with a street name in Chicago.